Who doesn’t appreciate a good slice, especially here in NYC where pizza is so very important and such a point of contention – even for vegans! Our favorite place to order from is Viva Herbal Pizzeria where we can get spelt or gluten-free crusts with daiya and even vegan sausage as toppings (our personal fave combo!) Pala Pizza also has great vegan options and that brick-fired pizza taste, yum! Sometimes it is easy to buy dough and tomato sauce quickly whip up a pie at home, but if you are interested in making your own dough, here is a great recipe! 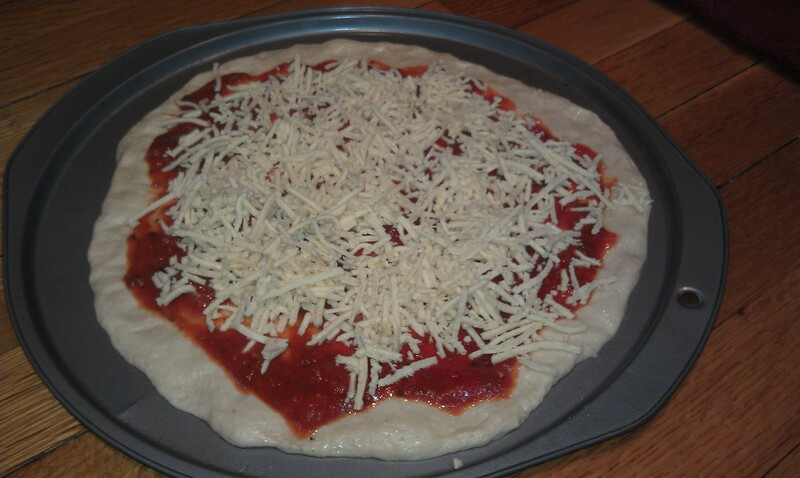 My mom made the dough and I added the homemade sauce (thanks mom!!). It was really very very good! Check out here for some of my other fun pizza nights 🙂 Flatbread Pizza with hummus, green olives, cherry tomatoes and za’atar (this is a raw one and Well Worth the effort! 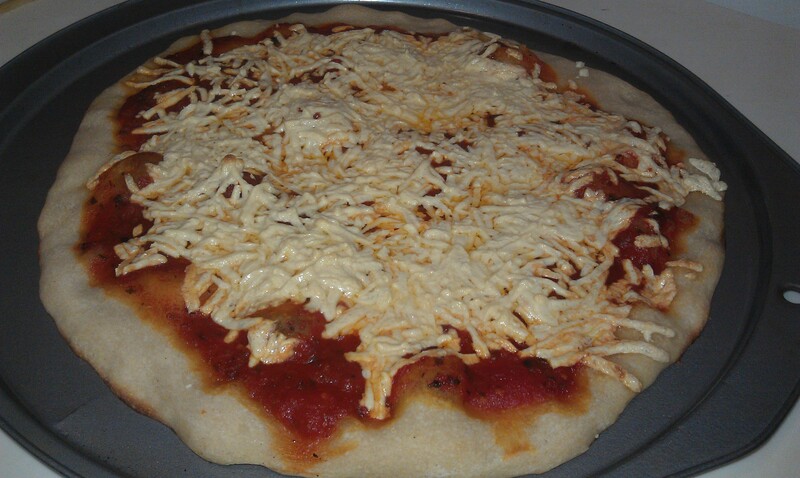 ), Raw Eggplant Pizzas and the quick at home whipped up kind with purchased dough. Mix together the warm water, sugar and yeast. Put aside to get foamy. If it does not foam then the yeast is not good – redo this step. In a separate bowl mix all of the other ingredients. Add in the yeast mixture and mix well until dough forms a ball. Place the dough on a lightly floured surface. Knead the dough – Use the palm of your hand and keep pressing in and folding it over and repeating for about 5 minutes. Prepare your topping. Stretch out the dough and aim for it to be even thickness all around. Top your pizza and place in the oven. Bake for 8 minutes. Let it rest. Add any herbs to your pizza afterwards. As you know I LOVE Potlucks! And now we have a pretty regular Vegan Themed Potluck Party happening 🙂 Last nights theme was Italian Night! (last month was Asian) SUPER YUM! Not kidding this meal was out of control. We didn’t end up having dessert, but we all happily had seconds of the deelish food! 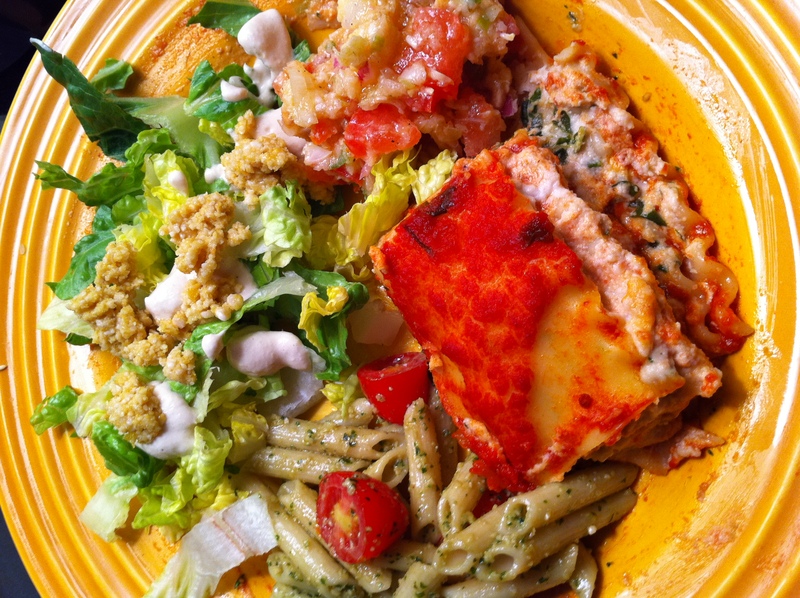 Lisa Dawn made this OUT of this world lasagna! We have seen her amazing Ricotta Cheese in her Stuffed Shells, but to taste this you would think that this was gourmet ricotta cheese made in Italy. But happily it was Vegan (but still super gourmet :)) And the homemade tomato sauce was also deelish! Joey made this amazing pesto pasta sans cheese of course. 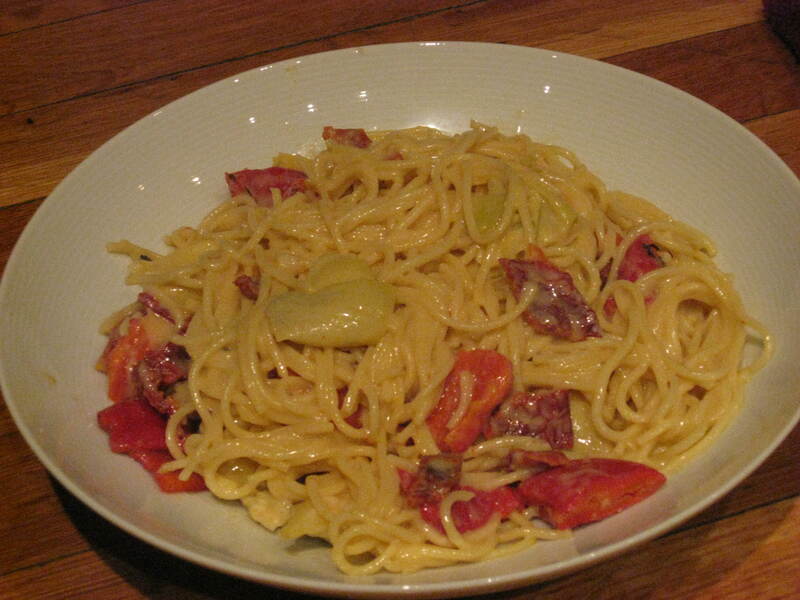 It was so gorgeous with the fresh grape tomatoes and basil! Beautiful and super tasty! I made my favorite Raw Crisp Caesar Salad with Pinenut parmesan and Artichoke Guacamole with mulit-grain pita chips. Yum!!! On a side note, I can’t help but brag about Lisa & Paul’s overly impressive and adorable son Luke! Lisa had this great deck of cards with all the US Presidents pictures on them. Luke was able to go through all of them and name them!!! SO CUTE!! And he is under 2 years old! Such a super great night with friends and deelish vegan food! Amazing photo courtesy of Lisa's fabulous husband Paul! I am not sure this is a guacamole but it is definitely an amazing bruschetta or dip of any kind. Very sophisticated flavors. We really really loved this. Such a fun snack or dinner with pita chips or crostini. Plus super low in fat and calories, which I love! 1. Place artichoke bottoms in a small saucepan, cover with water, and bring to a boil over high heat. 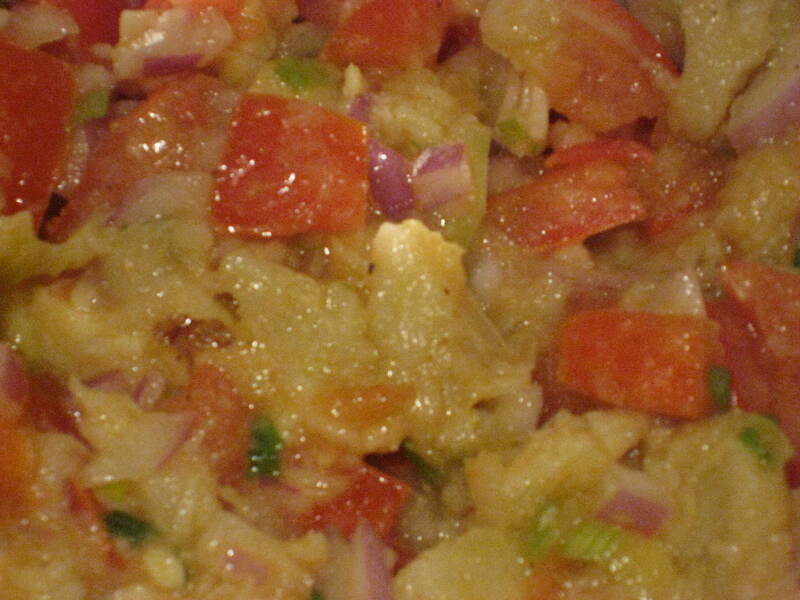 Reduce heat to medium-low and cook until the artichokes are very soft, about 20 minutes. Drain. 2. When cool enough to handle, finely chop the artichokes and place in a medium-size mixing bowl. 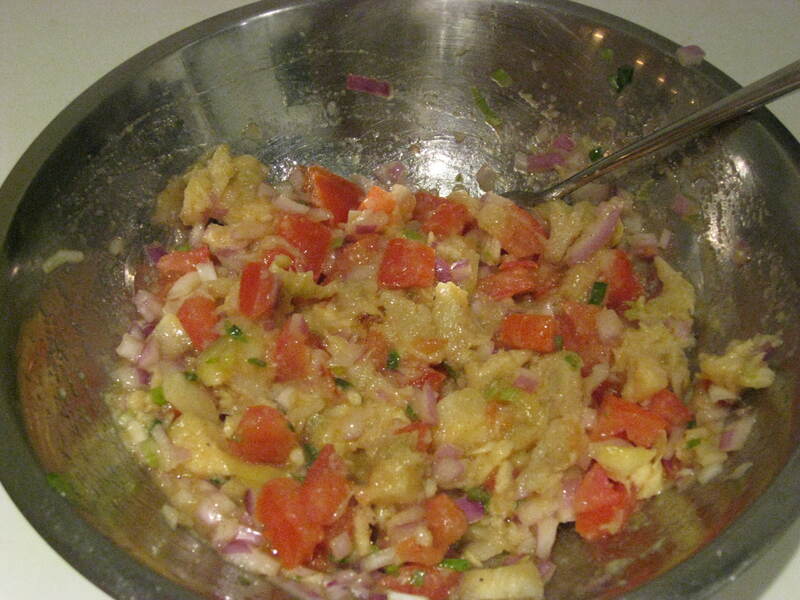 Add the onion, tomato, lemon juice, olive oil, sesame oil, scallions, salt, and pepper and gently mash with a fork. This soup was sooo good! Thanks Bryanna! It was super easy and super deelish! I love artichokes and the taste that lingers in your mouth after you have eaten them. 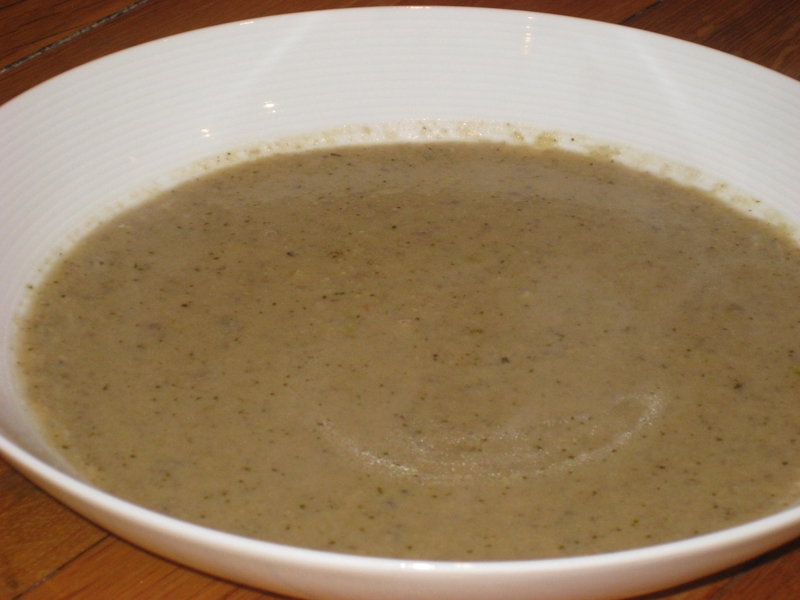 This soup is just divine and super creamy and Vegan! Yum! Highly recommend! Bryanna also listed the nutrition stats, which is always helpful! Plus I just found out this is the coldest winter in NYC since 1977. No wonder I am craving soups lately! 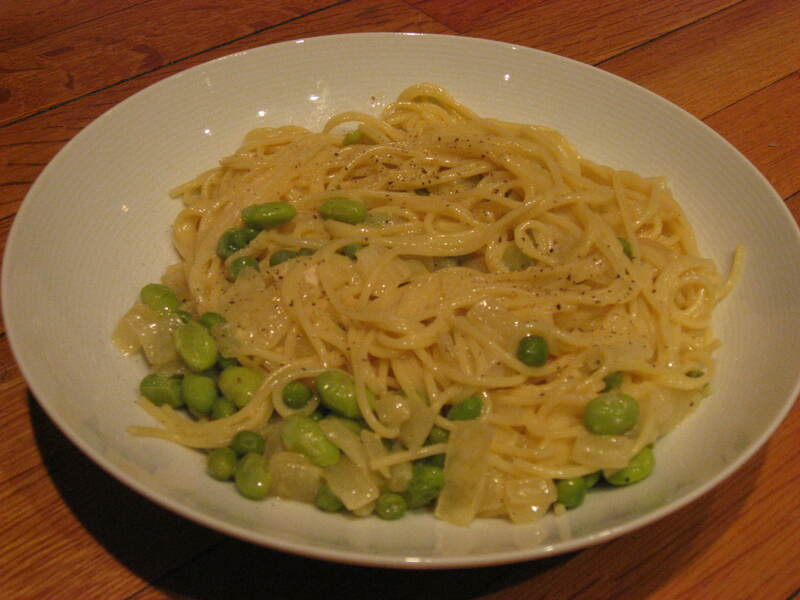 Melt the vegan margarine or heat the olive oil in a large pot. Add the mushrooms and shallot and stir-cook over medium-high heat, about 5 minutes. Stir in flour and stir-cook for 1 minute. 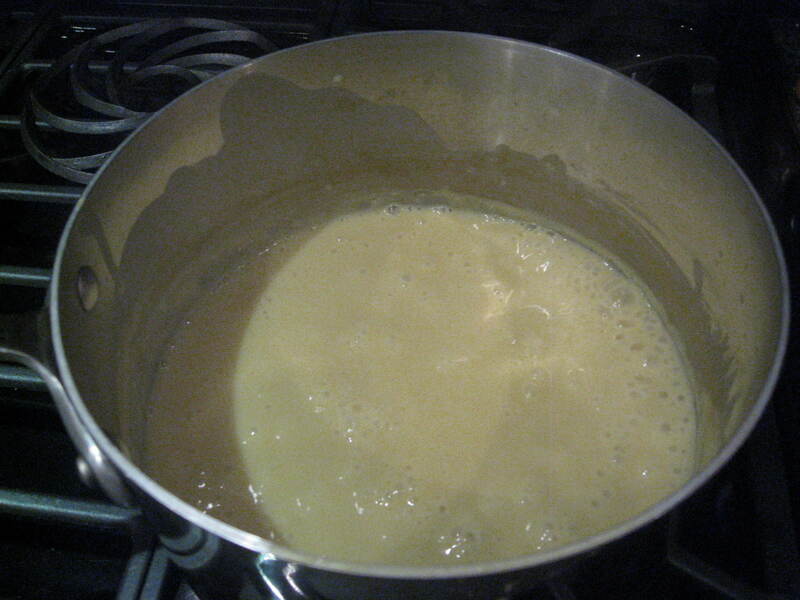 Vigorously stir in the nondairy milk and bouillon and let it come to a boil, stirring. Cook 1 minute, stirring consistently. Add the artichokes, reduce the heat to a simmer and cook, uncovered, for 5 minutes. 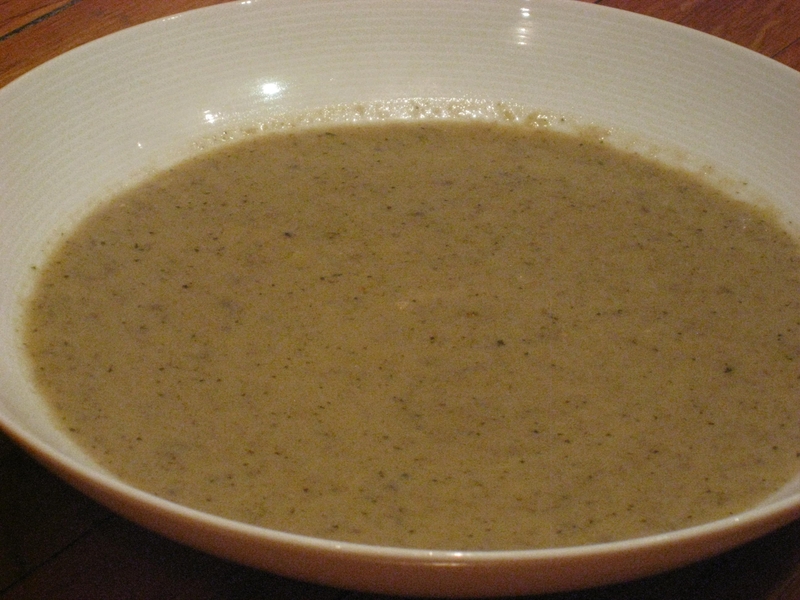 Either use an immersion blender to puree the soup or Carefully pour into a blender and puree there. If you are using an external blender pour back into the pot. Add the pesto and stir to combine. Nutrition (per serving): 285.1 calories; 27% calories from fat; 9.0g total fat; 0.0mg cholesterol; 3578.0mg sodium; 1272.9mg potassium; 44.1g carbohydrates; 12.9g fiber; 14.5g sugar; 31.2g net carbs; 22.3g protein; 5.6 points. Check out the steam coming off the top of the soup!